Researchers are investigating the safety and efficacy of BBI608 (napabucasin) plus various standard chemotherapy regimens for the treatment of patients with advanced gastrointestinal cancer. Description: For this open-label, phase 1b/2 dose escalation study, researchers are investigating the safety and efficacy of BBI608 (napabucasin) plus various standard chemotherapy regimens for the treatment of patients with advanced gastrointestinal cancer. In the 7 arms of the study, patients will receive oral BBI608 twice daily continuously in combination with FOLFOX6, FOLFOX6 and bevacizumab, CAPOX, FOLFIRI, FOLFIRI and bevacizumab, regorafenib, or irinotecan. The primary endpoints are the number of patients experiencing adverse events as a measure of safety and tolerability across all study arms, and the objective response rate of FOLFIRI-refractory patients with metastatic colorectal cancer who are treated with BBI608 plus FOLFIRI. 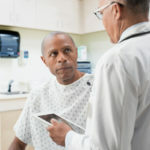 Secondary outcome measures include assessment of the pharmacokinetic and pharmacodynamic profile, anti-tumor activity across all study arms, and disease control rate, progression-free survival, and overall survival among FOLFIRI-refractory patients with metastatic colorectal cancer who are treated with BBI608 plus FOLFIRI. The estimated enrollment is 609 patients. For more study information, including inclusion and exclusion criteria, study locations, and contact information, visit https://clinicaltrials.gov/ct2/show/NCT02024607. Status: This study is open and recruiting patients as of September 25, 2017. This study is sponsored by Boston Biomedical, Inc.
Clinicaltrials.gov. A phase Ib/II clinical study of bbi608 in combination with standard chemotherapies in adult patients with advanced gastrointestinal cancer. NCT02024607. https://clinicaltrials.gov/ct2/show/NCT02024607. Accessed September 25, 2017.